We offer a wide variety of key tags ranging from heavy card stock paper tags to solid brass key tags that are excellent for heavy duty users and may be stamped or engraved. 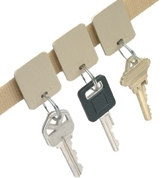 And, we have 'unbundled' our bulk key tags. This means that you no longer have to take the ring out of the tag, remove the insert, label the insert, put the insert back into the tag and then put the ring back in the tag. Now you simply print the inserts on your printer, place them in the tags, put in the the key ring and keys. You only have to do the job once.